As the holidays are winding down, I’m feeling the need to do a little unwinding myself. For the final hurrah, I will be mixing up this effortless holiday punch. What’s on your New Year’s Eve menu? 1. 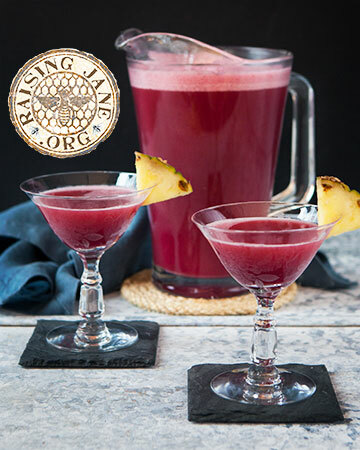 In a 3-quart pitcher or large punch bowl, combine cranberry juice and pineapple juice concentrate. Add sparkling water, and mix well. 2. Serve immediately. If desired, garnish glasses with fresh pineapple wedges. I bet this punch tastes as delicious as it presents beautifully in the glass. Refreshing and festive! Tonight as we view the Cotton Bowl, we w I’ll need several pitchers of this brew. Ohio State University needs my support. Oh my goodness! This sounds delicious! Cranberry juice is one of my favorite juices and I love pineapple. This will definitely be making it to our table for New Years.